Pressure measurement is a common element of industrial operations or control systems. Fluid processing can often involve media that is potentially harmful to pressure sensing devices. The media may be corrosive to the sensor material, or other media properties may impact the performance or usable life of the instrument. In process control environments, diaphragm seals play a role in protecting items like pressure sensors from damage by process fluids. The diaphragm seal is a flexible membrane that seals across the connecting path to a sensor and isolates the sensor from the process media. System pressure crosses the barrier without inhibition, enabling accurate measurement, but the process fluid does not. Typical materials composing diaphragm seals are elastomers, with a wide variety of specific materials available to accommodate almost every application. 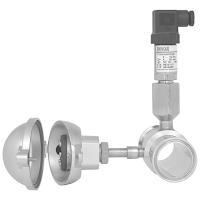 In the operating principle of the diaphragm seal, the sealed chamber created between the diaphragm and the instrument is filled with an appropriate fluid, allowing for the transfer of pressure from the process media to the protected sensor. 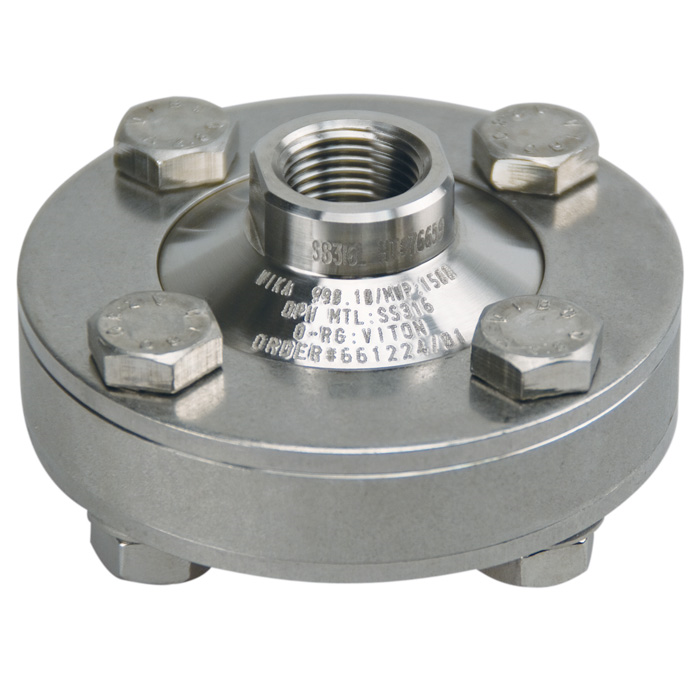 The seals are attached to the process by threaded, open flange, sanitary, or other connections. 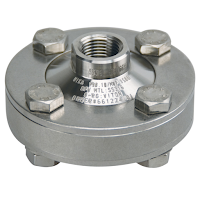 Diaphragm seals are sometimes referred to as chemical seals or gauge guards. Stainless steel, Hastelloy, Monel, Inconel, and titanium are used in high pressure environments, and some materials are known to work better when paired with certain chemicals. accumulation of process fluid in pressure ports, a possible source of contamination. If such a buildup were to occur, such as milk invading and lodging in a port on a pressure gauge, the resulting contamination compromises the quality and purity of successive batches. Extremely pure process fluids, like ultra-pure water, could be contaminated by the metal surface of a process sensor. Some pneumatic systems rely on the elimination of even the smallest pressure fluctuations, and diaphragm seals prevent those by ensuring the separation of the process materials from the sensors. Diaphragm seals are not without some application concerns, and devices are now built to address and counter many potential issues related to the use of diaphragm seals with process monitoring instruments and equipment. Products seek to eliminate any and all dead space, allow for continuous process flow, and are self-cleaning thanks to continuous flow design. Some high pressure seals come equipped with anti-clogging features, accomplished by the elimination of internal cavities while protecting gauges. Multi-purpose seals reduce temperature influence and improve instrument performance while pinpointing and diffusing areas of high stress. These pre-emptive measures result in longer instrument life-cycles and improved performance while ensuring protection from corrosion. There are numerous options and available diaphragm seal variants. Share your application specifics with a product specialist, combining your own process knowledge and experience with their product application expertise to develop an effective solution.